This program requires that the brother learn specific material for each of the 3 degrees conferred in the Lodge. 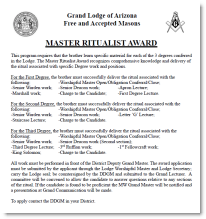 The Master Ritualist Award recognizes comprehensive knowledge and delivery of the ritual associated with specific Degree work and positions. All work must be performed in front of the District Deputy Grand Master. 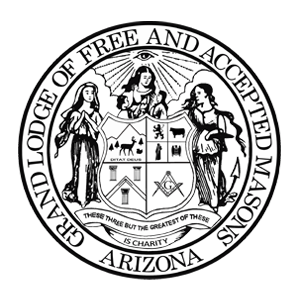 The award application must be submitted by the applicant through the Lodge Worshipful Master and Lodge Secretary; carry the Lodge seal; be countersigned by the DDGM and submitted to the Grand Lecturer. A committee will be convened to allow the candidate to answer questions relative to any sections of the ritual. If the candidate is found to be proficient the MW Grand Master will be notified and a presentation at Grand Communication will be made.